History: (Uncanny X-Men#261 (fb) - BTS) - Though many Morlocks were slain during the Mutant Massacre, some managed to survive, hiding in the outer tunnels. 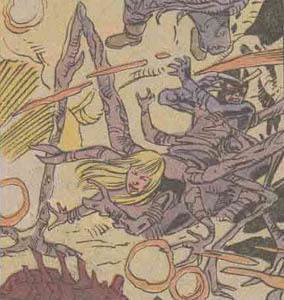 As the Morlock leader, Callisto, left the Alley to help the wounded Morlocks who'd been transported to Muir Island for treatment, the sadistic Morlock known as Masque, who possessed the power to mold flesh with a touch, organized a group of survivors in an attempt to wrest control of the Morlocks from their beleaguered leader. (Uncanny X-Men#254-260) - When Callisto returned, Masque and his followers captured, tortured, and transformed her, with the aid of the telepath Beautiful Dreamer, into an amnesiac fashion model. Masque was not content with this, however, as Callisto soon became a success, and, with the recent apparent death of the X-Men, he decided to reach for even more power, by breaking into the X-Mansion and stealing their technology. (Uncanny X-Men#261) - Bliss (as Jean Grey), Bouncer, and the other X-Doppelgangers invaded the X-Mansion, capturing Jean (who was, needless to say, surprised to see herself; she mistook Bliss for another Madelyne Pryor-type clone). 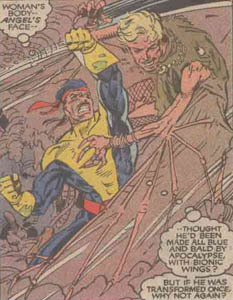 Bliss bit Jean, rendering her unconscious, and the gang fled when confronted by Forge and Banshee. 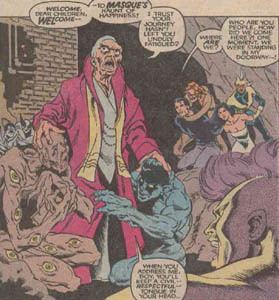 (Uncanny X-Men#262) - Cornered by Banshee and Forge at Salem Center, Bouncer teleported the Morlocks away, presumably back to the tunnels, leaving the real Jean behind. Later, as the heroes re-grouped back at the mansion, Bouncer struck again, taking Jean and Banshee as Forge watched helplessly. Forge pursued them into the Morlock Tunnels, tracing Jean and Sean by "tracker-tags" he'd implanted in their bodies for good measure, and came across the Storm doppelganger. Horrified, Forge believed that it was really Storm, and couldn't bring himself to shoot the woman he loved. ��� Meanwhile, Peter Nicholas was attending a gallery showing of his art when he noticed Callisto, who had been shadowing him. Chasing after her, he watched her get into a car, which the Genoshan Mutate Jenny Ransome quickly stopped with her bare hand, then carelessly ripped the roof off. However, Bouncer had transported Callisto and her driver away, (the driver was never seen, apparently s/he was either killed or mutilated by Masque and his goons). As Peter sat in his apartment, trying to make sense of everything, Callisto came to the door, looking drugged (maybe from a bite of Bliss? ), and Masque jumped from the shadows. Masque had Bouncer teleport the subdued Peter and Callisto to the tunnels for his own amusement. 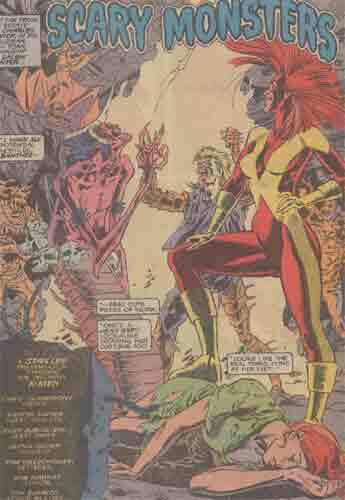 (Uncanny X-Men#263 - BTS) - Masque had Bliss transformed into a replacement for the dead "Storm", and created a new "Jean Grey", complete with tentacles. 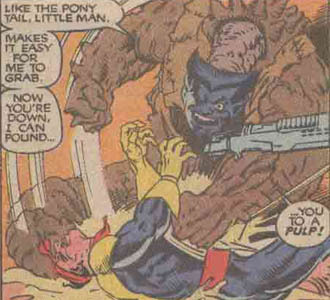 (Uncanny X-Men#263) - Forge, Banshee and Jean tracked down Masque to his "Haunt of Happiness" using Forge's Pathfinder and Eye-Spy, as Masque and his gangsters tortured Callisto and Peter, unwittingly turning Peter back into Colossus. After a little "fun", Masque set his merry little band on a hunt, with Callisto and Peter as the prey, and promised to kill Peter if they were caught. The Morlocks soon caught up with the couple, but found it hard to carry out their promise, as Callisto swiftly snapped "Angel's" neck. Masque had Bliss subdue her with a bite, then stabbed Peter, whose armored body deflected the blade. As the other heroes rushed in, Masque's gang was outmatched, and a chase ensued, with most of Masque's Morlocks being knocked out or killed. Penned in, Masque hid behind Bliss, using her to try to knock out all of the heroes, but her bite had no effect on Forge's metal hand, and she was knocked out herself. With Jean's tentacles and Peter's metal hands squeezing around his scrawny neck, Masque finally relented, and had Bouncer teleport the X-Men away, where Forge was able to fix up one of his handy-dandy devices to restore their original forms. ��� Masque's constant warping and changing of his team made it almost impossible to keep track of who was who. No wonder so many Morlocks went insane! I wonder why Masque didn't make a Morlock Colossus. Interestingly, after Masque's recent return from the dead, she (she's now a woman) transformed Callisto's arms into numerous tentacles...it must be some kind of personal fetish. "Angel" was a woman possessing bat-like wings, Masque altered her face, and later her body, into a mirror of the X-Man Angel (without the blue-skin, as Forge noted) S/he was killed by Callisto when s/he attempted to get the drop on her. "Beast" There were at least two Morlock "Beasts", one with a hard, dinosaur-like body (seen in#262), and one with a blue furry body (Or maybe Masque just upgraded). Their fates are unknown. Bouncer was the team's teleporter. He or she was never identified in any of the panels, only the portal signature he/she left. Bouncer survived this encounter. 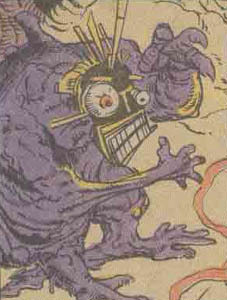 "Havok/Magik" was a grotesque, insectoid creature with a head on each end. It/they may have been further altered by Masque after the initial encounter. It/they apparently survived. "Nightcrawler" was seen in "Masque's Haunt of Happiness" being worked on by the master. He was given the form of the eye-covered creature at Masque's left hand, while the left-hand Morlock was turned into a Nightcrawler double. They were later knocked out by Colossus and Forge respectively. "Professor Xavier" was possibly THREE different Morlocks. The first (seen in#262) had a skinny, chitinous body; the second (in#263) had the warped body of a seal-like beast; and the third, seen fighting Colossus, had a humanoid form. "Storm" had Storm's upper body, but the lower body of an insect-like creature. Forge couldn't bring himself to kill her, due to her resemblance to his lover, but accidentally shot her dead when she attacked from behind. Masque quickly replaced her with Bliss. "Warlock" had the face of Warlock and the body of a dinosaur on acid. His fate is unknown.